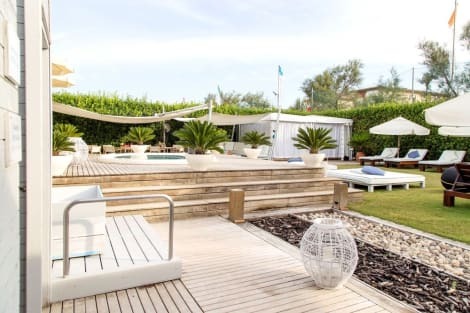 This charming hotel can be found in Cervia. The establishment comprises a total of 120 snug rooms. This property does not accept pets. When you stay at Hotel Lungomare in Cervia, you'll be near the beach, within a 10-minute walk of Cathedral of Santa Maria Assunta and Cervia Town Hall. This beach hotel is 8.6 mi (13.8 km) from Mirabilandia and 0.7 mi (1.1 km) from Piazza Garibaldi. Make yourself at home in one of the 35 air-conditioned rooms featuring minibars. Rooms have private balconies. Complimentary wireless Internet access keeps you connected, and satellite programming is available for your entertainment. Private bathrooms with showers feature complimentary toiletries and bidets. With a stay at Al Faro in Cervia, you'll be within a 15-minute walk of Museum of Salt and Cathedral of Santa Maria Assunta. This hotel is 7.9 mi (12.7 km) from Mirabilandia and 0.8 mi (1.3 km) from Piazza Garibaldi. Make yourself at home in one of the 40 air-conditioned guestrooms. Rooms have private balconies. Complimentary wireless Internet access keeps you connected, and satellite programming is available for your entertainment. Private bathrooms with showers feature bidets and hair dryers. Enjoy a meal at Al Dante, or stay in and take advantage of the hotel's room service (during limited hours). Relax with your favorite drink at the bar/lounge or the poolside bar. A complimentary continental breakfast is served daily from 7:30 AM to 10 AM. lastminute.com has a fantastic range of hotels in Cervia, with everything from cheap hotels to luxurious five star accommodation available. We like to live up to our last minute name so remember you can book any one of our excellent Cervia hotels up until midnight and stay the same night.